A half-dozen eggs (which, if consistent with prior, is worth its weight in yolk). My partner was lovely to go get the goodies this week, interrupting dinner preparations (a very delicious lasagna that incorporated the very last of the last CSA, a lonely and odd eggplant in the back of the crisper that thought we’d never get there). My partner dutifully reported back to me on the friendliness factor, noting they were in their usual exclusionary mode. I don’t mean to bite the hand that feeds me, here, in reporting my overall impressions of the produce and the people. I still am glad I’m doing it. But I’m also not so impressed with myself for being a member of a CSA that I’m unwilling to question when things (either product or delivery) doesn’t live up to some basic standards. In the past, I have asked for feedback from others on their experiences with a CSA. I’ve gotten good feedback (thank you, fellow revelers). I’d like to hear more from others in a CSA now as we wind down the season, and particularly in light of the bad weather season we’ve had. Is it standard practice for farmers to send out an email toward the end of the season? Have you gotten any? How’s your season been, now that it’s almost over? Is it over? 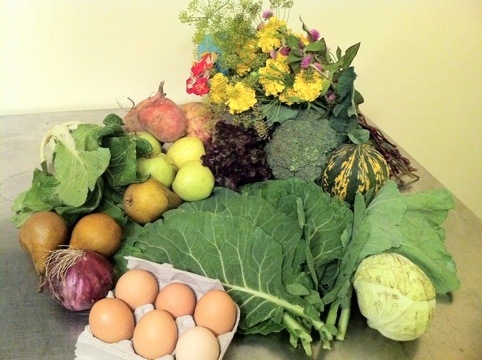 Out of curiosity, do you know if any of the CSA farmers are supplying commercial stores? My guess is that they are. Much of the produce in stores is less than spectacular this year as well. I am not a member of a CSA, so what follows is strictly opinion. As far as whether to remain a CSA member, I would first think of whether the fee is really needed elsewhere, bills or whatever. If not, it is possible that next year’s crops will be better. If the CSA food is pesticide free it may be worth more than mass produced food that is sprayed. Another way of looking at it is that the CSA fee is helping to support a good cause (local farmers), and any food gotten there is a bonus. I have been a member of the American Littoral Society for quite a few years. In return for the annual fee there is no direct return except for discounts on some of the trips or events they have, none of which I have attended. I think the money I give them each year is worth it since their purpose is protecting the waters and coast from pollution and helping to re-introduce things like oysters back into what were once polluted waters. If at some point the annual membership becomes a burden I would stop it knowing that for all the years I was able to be a member it did some good for the environment. In the end it boils down to whether someone has some extra money they really don’t need for something more important and/ or ‘closer to home’.